We enjoyed a great dinner on the roof on Saturday, but this could easily be a week night dinner. I need to remember that skirt steak is the perfect match for a week night dinner. It doesn't have to be marinated and it cooks in 5 minutes. Season skirt steak with salt and pepper. Cook on a very hot grill for 3 minutes on one side, flip and 2 minutes on the other side. Let rest for a few minutes before slicing, on the diagonal, against the grain. 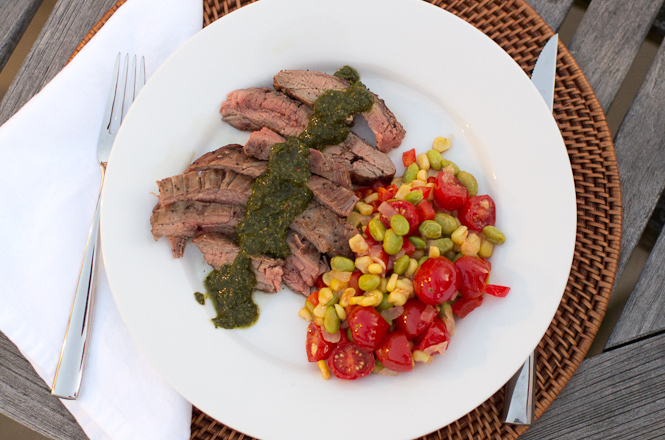 Serve chimichurri sauce over the steak. Have you noticed I'm not that great with measurements? I'm fine with it for baking but cooking? Um, not so much. I think it's because it doesn't really matter. Really like edamame? Use a lot! Prefer corn? Double up. In a large skillet, melt some butter and saute the onions until translucent. If you're using any frozen veggies (e.g. corn, edamame), add those and cook until heated through. Add any fresh veggies (e.g. corn that's been cooked/grilled/boiled/baked, red pepper, and tomatoes) and saute until heated through. Season with salt and pepper. 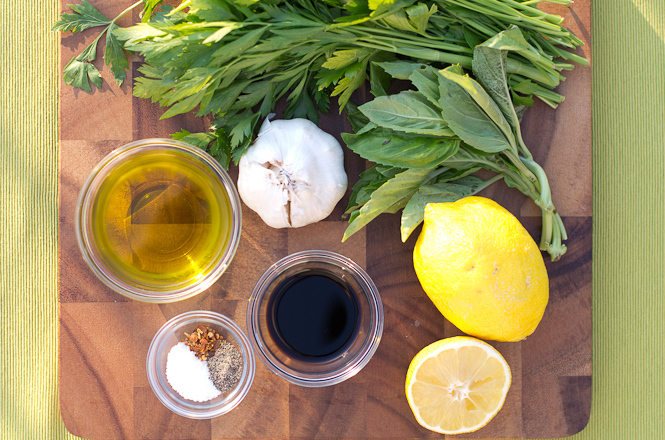 Right before serving, squeeze some fresh lemon juice over the dish and add fresh basil.